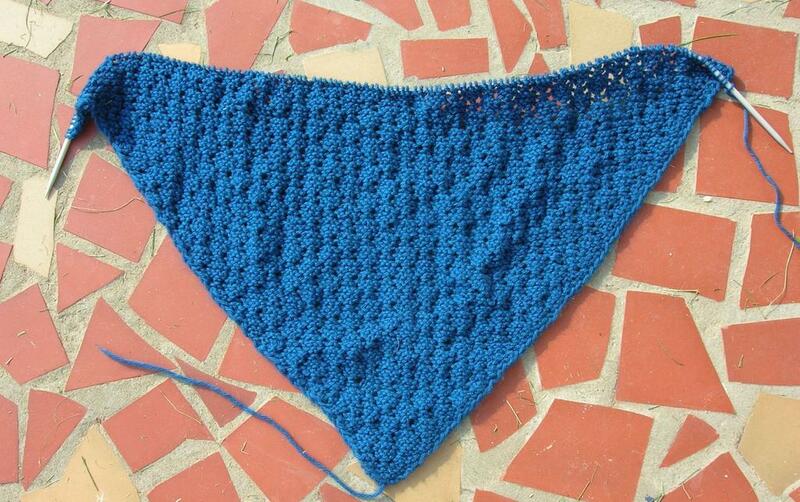 The Highland Triangle Shawl is finally appearing to increase in size. Have you ever worked on something for a LOOOOONNGGG time and not seen it increase in size? Finally, I looked at it today, and said, "It looks bigger!" If all my tinked rows had actually been knit rows, I would probably have been done by now. I'm habitually counting each row now to make sure it is right. This doesn't keep me from making mistakes, but at least I catch them pretty early. This one in Mason Dixon Knitting from Kay, who says, "That's knitting; it's not for the stupid. It requires a constant, graceful kind of intelligence." I love that -- a constant, graceful kind of intelligence. Here's an interesting essay from Naive Knitting about "Why we choose the projects that we do." 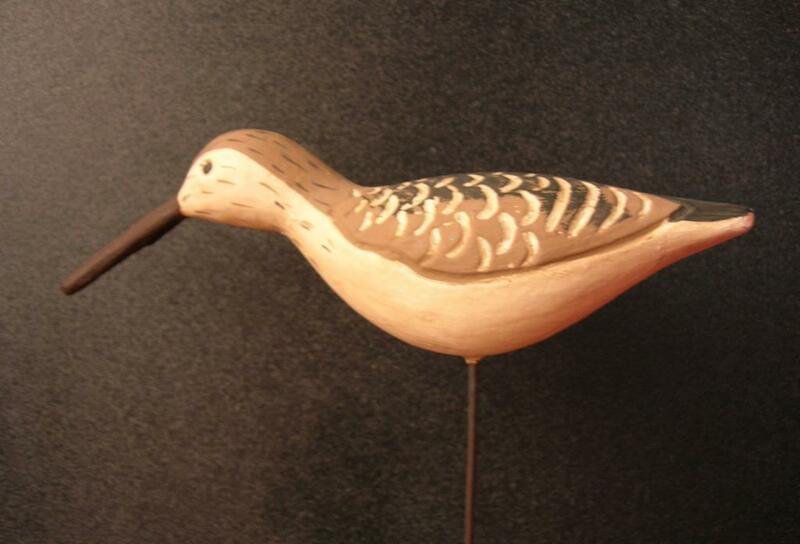 My husband brought this sandpiper home for me yesterday. It as a surprise gift. He bought it for me because the name of my blog is Sandpiper Knits. Isn't that great! It sits on our computer stand -- as mascot as I type. He's a sweetheart. The blog has been accepted to both the Knitters Blog ring and the Knitter's Review blog ring. Welcome to anyone arriving from these rings. 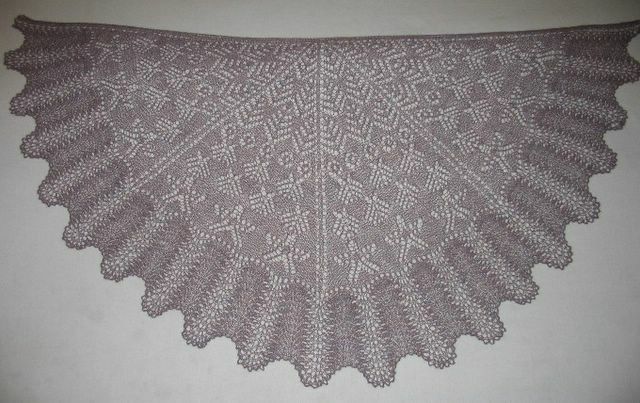 I've signed up as a member of the Mystery Shawl yahoo group. I'm trying to pick out yarn. I'm leaning toward a claret color of this yarn (Jaggerspun Maine Line 2/8). I need to order it soon -- the KAL begins on August 1. It sounds like fun -- it's a mystery shawl because only portions of the pattern of released at a time. I bought some more yarn to do another Branching Out scarf -- this one as a Christmas present for ??? I'm not sure yet. 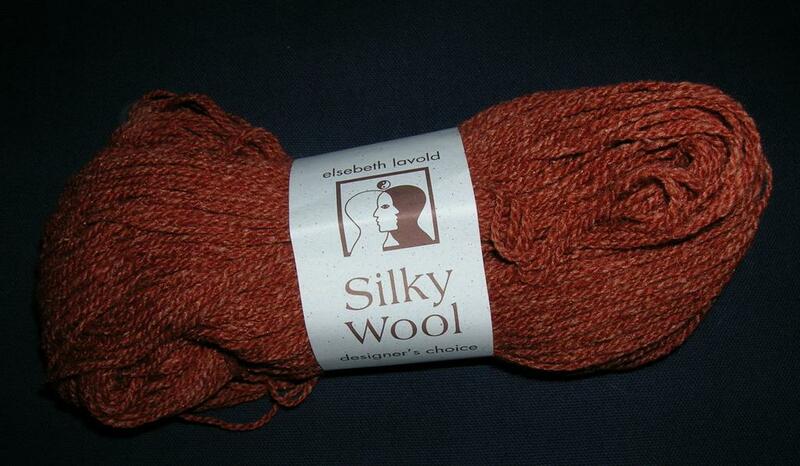 It's more Elsebeth Lavold Silky Wool. I'm making some progress on the Highland Triangle Shawl. I made an Excel spreadsheet with the stitch number for each row. I had this laminated, and I mark each row of the middle triangle off as I complete it and confirm stitch number. I've started the Highland Triangle Shawl. I used a white "Word" screen to that the pattern could be sort of visible. It's too dark to take an outside picture. The color I'm using is darker that is looks here. At first, I was having trouble with the knit 2 togethers and the slip 2 together (as if to knit), knit 1, and pass the slipped stitches over -- difficult to manuveur. 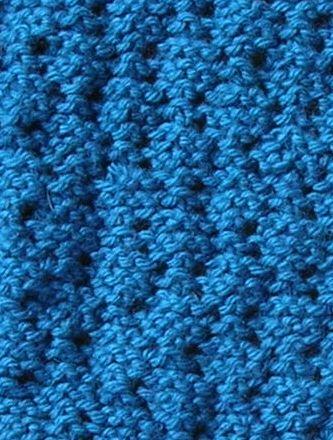 I think I've relaxed with the pattern, my tension is a little less stressed, and the stitches are easier to complete. We've also started reading the new Harry Potter. 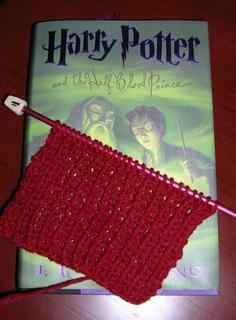 DH reads outloud while the boys and I listen, so I started a simple HP scarf -- 1 x 1 ribbing in maroon and gold. The color here is a little bright, too. I picked up a ball winder at AC Moore -- 40% off coupon -- yippee. I told DH that he would have to continue to the the swifty husband, since the swift was $60. Branching Out is finished and blocked. Final stats --> It took a little more than 1 skein of Elsebeth Lavold Silky Wool in charcoal. I don't know how much more exactly because the I had already used a little of the first skein. I did 28 repeats of the lace pattern on size 8 (US) needles. To see all posts related to Branching Out, click here. My KnitPicks order came today. It includes the yarn in the photos below. First is 10 skeins of Merino Style in storm. I will use this for my next large project, which is the Highland Triangle Shawl from Folk Shawls. 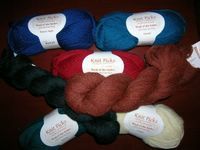 I also ordered five different skeins of Wool of the Andes in Stream, Winter Night, Cloud, Cranberry and Spruce. I picked up the Elizabeth I lace scarf patterns and two hanks of Alpaca Cloud in Midnight (my favorite of the lot) and Autumn. All yarns are yummy soft. My only problem with them is that they are generally lighter in color than I expected. It's really hard to tell on a computer monitor, isn't it? I joined The Knitter's Guild of America today. I've been thinking about it for a while, and thought I would give it a try for a year. 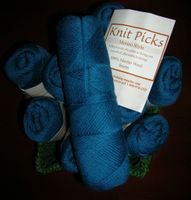 KnitPicks Merino Style in Storm for Highland Triangle Shawl. Yarn from KnitPicks -- Wool of the Andes in Winter Night, Stream, Cranberry, Spruce and Cloud. Alpaca laceweight in Midnight and Autumn. 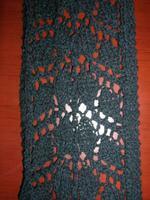 I was browsing through Fall 05 Interweave Knit and found this cabled shrug. I normally don't like shrugs. They are too small for my body type -- just too form fitting. But this one looks comfy -- the perfect thing to wear on a winter night in front of the computer or curled up in front of a fire (if one must have a more romantic image). It looks like it might be easier to keep positioned than a shawl. The back image is not online, but it is beautifully cabled. I think that this in on my To Do list. I'll have to find a yarn substitute, however. It calls for Trendsetter Kashmir, which is 65% cashmere and 35% silk. Luxurious, I'm sure, but more than my budget can handle. At $23 per ball x 12 balls for project = way too much money. It is listed as heavy worsted, so I'm sure I can find something else to use. I've placed an order with KnitPicks, and am now waiting with baited breath. 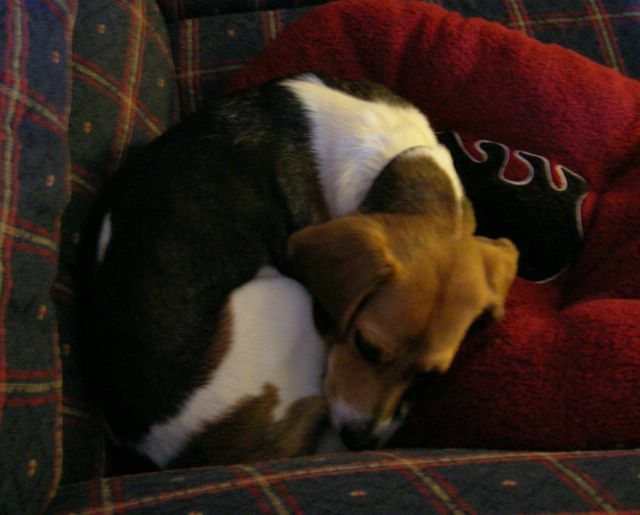 Here's Molly from above, sleeping in a little doggie curl on the couch. I've never blocked lace before, and I hear that it transfoms it. So -- I did it. I followed the directions in the Knitty pattern. Cold water soak, carefully squeezed out the water, placed length-wise in towel (beach towel) and pulled out most of the water. I lay the protective pad on our dining room table, then the beach towel doubled over twice, and pinned the scarf to the towel. I ran out of pins -- twice! I hope it dries in the shape to which it is blocked (isn't that the purpose of blocking?) We'll see. The light of God surround you. The love of God enfold you. The power of God protect you. The presence of God watch over you. Knitting news -- The blog was very quickly reviewed and accepted to the Southern Knit Bloggers ring. Welcome to any who wander this way from the ring. I am trying to decide on a new knitting project. After the Yarn Harlot talked about this shawl -- the Highland Triangle Shawl from Folk Shawls, I got interested. I already own the book. It calls for a DK weight yarn, and I'm thinking about Merino style from Knitpicks in the Storm color. 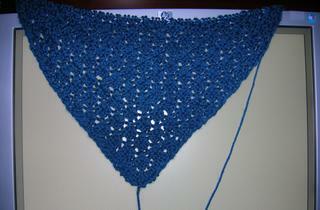 I'm part of the Summer of Lace yahoo group, and saw the finished SeaScape shawl pictured here. Hmm, another possibility, maybe with Alpaca cloud from Knitpicks in midnight? And then Creatures of the Reef from Fiddlesticks came to mind again. 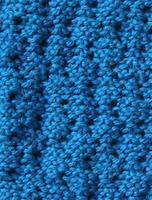 I like the yarn used in the pattern, which is Zephyr wool-silk, maybe in Indigo. See a blue pattern emerging? Time to order yarn! 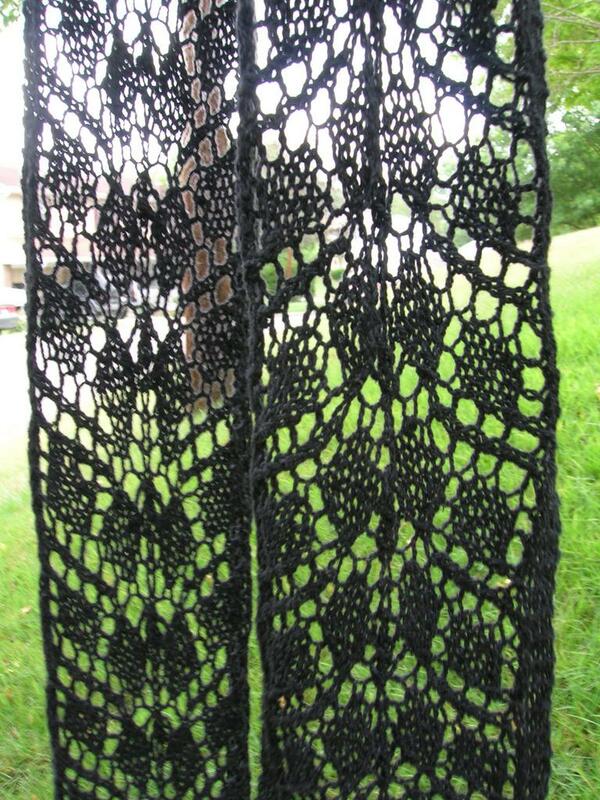 Here is a photo of my Branching Out scarf unblocked. Wish me luck, as I am now going to take her upstairs and block her. I hope this works! I've worked on my blog now for several months. It has been a learning experience -- trying to understand tags, incorporate pictures and buttons. I've really enjoyed it. Today I shoved the baby Sandpiper out of the nest. I applied to be a part of three knitting blog rings. We'll see if I get approval to join any of them. I've also designed a new button; just for fun -- because I really like playing with the button designing web page. If you are looking for a site to use to design simple buttons, check out GRSites Button Maker. 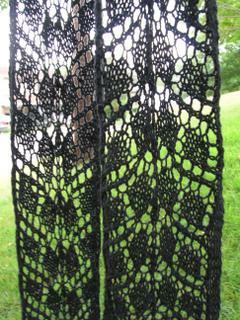 I finished the Branching Out scarf. Well, almost. I have finished the knitting and need to block it yet. 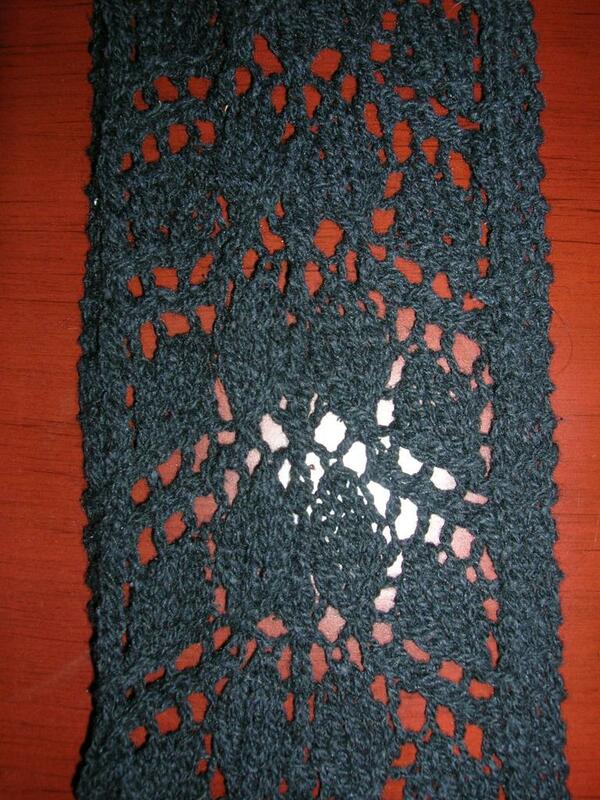 I'm looking forward to the blocking -- everything I read says that blocking really changes the look of lace. I'll post a pre-blocking picture from home. I've started another felted purse. Mom has been in the hospital, and I wanted something mindless to do in her room. I'm using a navy blue Brown Sheep Lambs Pride, 10 1/2 needles (circular, 24 inch) and just knitting knitting knitting. Cast on 88, knit 56 rows. No stripes in this one. I want to do the project from Pawley's Island pictured in the previous post, but I need to pick up needles first. My LYS is closed for vacation, and I can't find size 19 needles with sharp enough points to avoid frustration during the endless K2T.